There are certain food-related events that will be with you your whole life. These memories have a way of sticking with you so that days, months, or even years later you can still close your eyes and almost feel what you felt and taste what you tasted all that time ago. I can easily transport myself to Tahiti by recalling our breakfast on the private deck of our over-water bungalow, enjoying a cheese plate and a bottle of Veuve Clicquot. (I try not to think about the outrageous markup on said bottle. Ouch.) Cheese has never tasted creamier or richer. I have many remembrances like these of meals that I have shared with Andy. Perhaps they were days on which something significant happened, or maybe it was just a regular day made memorable all the same…a perfect spot in time that you wish you could stay in forever. These are the easiest to recall because they are the most recent. Childhood memories are farther and fewer between. I’m not sure my annual birthday dinner of choice at Coco’s Diner when I was 7-12 years old qualifies as culinary bliss. (The things you’ll do for an ice cream sundae!) I do think back fondly on favorite dishes that came from my parent’s kitchen: my mom’s porcupine meatballs with rice poking out of them or my dad’s breakfasts of snowman-shaped pancakes topped with peanut butter and syrup. But hands-down, the event that I can most vividly remember is my mom taking me to my grandma’s house after kindergarten and eating grilled cheese sandwiches while watching “The Flying Nun.” I always requested that my drink come in the “wrinkle glass”, named by me for it’s curvy lines. Nothing particularly special happened on these days…just me, my sandwich cut into four triangles and Sally Field…but it is still so present in my mind. Maybe it’s because I don’t have tons of memories of my grandma and I cling with all my might to those that I do have. Whatever the reason, I love that one of my best food recollections is of a grilled cheese sandwich. Comfort food at its finest. So yesterday, when I was feeling a bit down in the dumps, the only thing that sounded good to me was comfort food. We are not huge pasta nuts in this house, but suddenly pasta was all I could think about…something rich and creamy. After a rough day of being unproductive and moping around, I got into the kitchen and cooked. When the dish was in the oven, I felt ten times better. And after eating it, well, let’s just say that I had forgotten all about my bad day. I’ve recently become a member of the #sfsmarties, a group of bloggers who work with Smart & Final on promotional campaigns, providing feedback and using their products. This week, I was asked to create a recipe using one of their sale items. I happily accepted the challenge and was pleased to see one of the products was Farmer John Smoked Sausage (3 pounds on sale for $5.99). With as much bacon as we’ve been eating lately, sausage would be a nice change, and the possibilities for using it in recipes are endless. But I already knew that I would make a comforting meal of cheesy pasta. This dish is perfect for a weeknight meal, on the table in under an hour. In a large pot, heat olive oil over medium-high heat. Add sausages and cook until browned, stirring occasionally. Remove sausages and let drain on a paper towel. Reserve. Meanwhile, boil water for pasta. When boiling, add penne and cook for 11 minutes, until al dente. Drain and reserve. In the same pot you cooked the sausage, add shallots and cook until softened, about 1-2 minutes. (If pot is too dry, add a little extra olive oil.) Then add garlic and cook for about 30 seconds. Pour in chicken broth and scrape brown bits off bottom of pot with a wooden spoon. Bring chicken broth to a simmer and reduce for about 5 minutes. Next, add cream and reduce for 5 minutes. Crumble goat cheese into sauce and whisk to incorporate. Season with salt, pepper and cayenne pepper (if using). Remove from heat. Add pasta, sausage, peas and gruyere cheese into sauce. Stir together to combine. 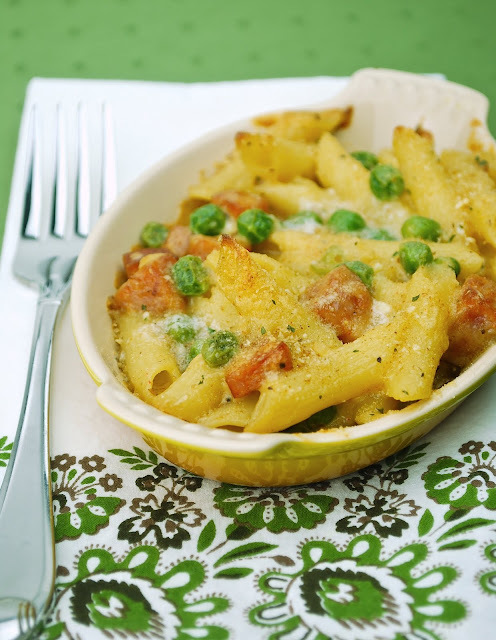 Divide pasta mixture into 6 individual oven-safe dishes (or one large). Sprinkle the top of the pasta with bread crumb mixture, then dot with cubed butter. Bake for 20 minutes, until tops are browned and crusty. Hello, comfort food! This pasta dish is exactly what I was craving. It’s crusty on top, cheesy and creamy underneath, and has a little kick from the hot sausage and cayenne pepper. And perhaps my favorite part of the whole thing is the way the peas give a little pop when you bite into them. Like I said, this pasta turned my grumpy mood into a much happier one. Make this when you need a pick-me-up. This post has been compensated as part of a social shopper insights study for Collective Bias. All opinions are my own. My 10 year old is HUGE into pasta (thank you, Italian genes) and sausage is about her 2nd favorite thing in the whole world (and thank you, German genes) - she would love this! Thanks for the awesome recipe, Karen! These are some beautiful photos! I hope your comfort food hit the spot for you! So yummy looking!!! You are not nice bcz I am just having leftovers for lunch. I want that;). Is the sausage really spicy? 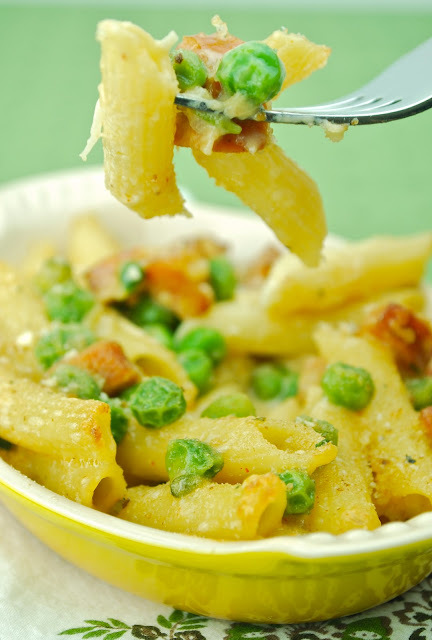 This pasta dish sounds oh so yummy good! Comfort food at its best. That looks so good! I love trying out new pasta recipes! Saved and buzzed! This sounds simple but looks gorgeously yummy...!! I love how you can see the cheesey goodness baked into this dish! This looks delicious and when I'm kinda down, all I want is creamy pasta. We need to do a comfort/wine party! I'm kind of hoping my mouth will stop watering long enough to make this myself. It looks excellent! Beautiful! I would certainly call this COMFORT FOOD! Grilled cheese is one of mine favorites too...but I just might take this pasts dish over the classic sandwich! YUM! Great looking comfort food! When my brain saw the sausage it gave a low whistle :) Thanks for sharing! Hello Comfort Food indeed! Your pictures brought the pasta dish so upclose and personal. Almost like you could reach in and take a bite. Great recipe and pictures. 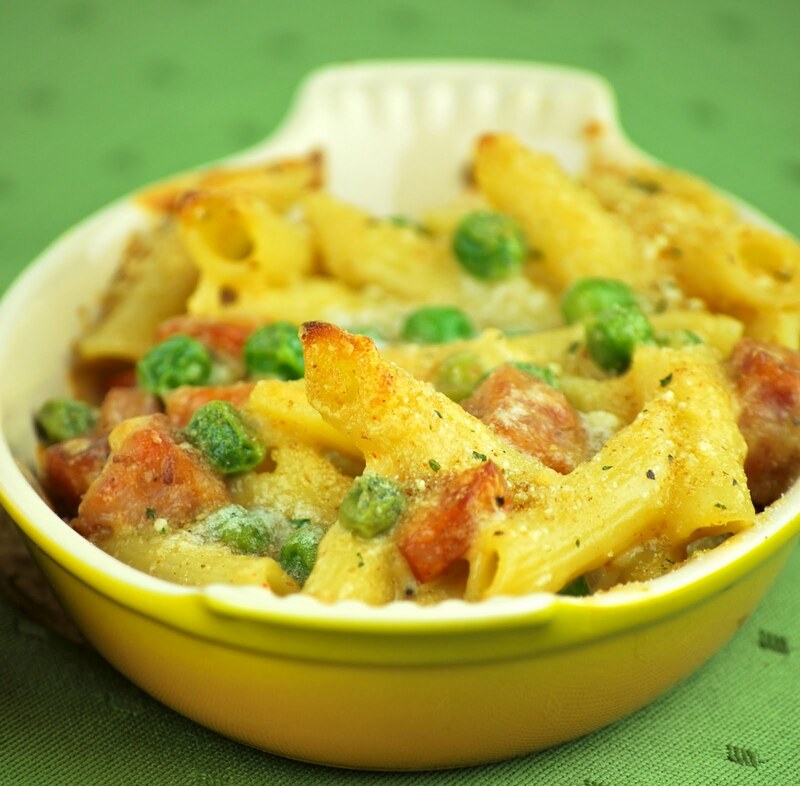 I love pasta, peas & sausage :) It IS comforting because it reminds me of home. Mmm baby! I love individual baked pasta dishes! This one is no exception ;-) Love all the ingredients and you take great pictures! Comfort food all the way. Looks so gooood! I can tell that my kids would love this! Your photos are so beautiful, make me want to grab that fork and dig right in! Three (!) cheeses and sausage? That's my type of pasta :) amazing recipe! Yum! I love this kind of comfort dish. I actually thought of making it last week, but now looking at this, I might try your version. LOL. :-) Thanks for sharing the recipe! I am ready to dig my fork into that and skip yoga tonight. My oh my that looks good! Thanks for sharing this one. Pasta is one of MY food groups. This looks wonderful. That tells you how old am. This definitely looks like comfort food to me. I love cheesy pastas with crispy crusts! This is a dish for everyone. The love of pasta with so much flavor has to be good. I made this tonight, and any one trying to please a large group of picky eaters... should try this now. Perfect with baguette garlic bread! I made this tonight and it was oh so good and comforting. Thank you!